Beautifulsubmitted by Marcus V. - Nov 01, 2017 |Recommended: YesI love the aesthetic of the complex, good office service, responsive maintenance service, and good flexibility in interior design. Great Location, Price is a Little Highsubmitted by Kenton E. - Oct 01, 2017 |Recommended: YesGreat Location, Price is a Little High. Great ward and friendly environment. It's a good first apartment submitted by Savannah R. - Aug 31, 2017 |Recommended: YesIt's good overall- it was what we could afford. Wasn't perfect and there were some things we would complain about but we made it work. Grounds are well kept and staff is friendlysubmitted by Brendan M. - Jun 01, 2017 |Recommended: YesCambridge Court is very well kept and in a convenient location. Parking is ample and i've never struggled to find a spot. The manager McCall is always very friendly and willing to help. It can get a little warm in the summer months, so keeping the windows open or running the A C might be necessary. There is some noise present, but it's not unbearable and as much as you would find in other places. 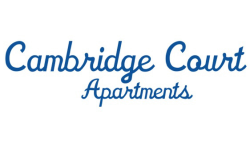 Cambridge apartmentssubmitted by Brent K. - Dec 28, 2016 |Recommended: YesWhile there needs to be a few updates to these apartments, overall the experience has been good. My wife and I feel this is a great starter apartment in a great location. Staff is very helpful and always willing to go the extra mile. Cambridge Court A Walk of Life to Remembersubmitted by Nicholas M. - Nov 10, 2016 |Recommended: YesThis has been the most quiet and pleasant of places to live. Management is fair and responsive. Rent is reasonable. And the facilities provide a place for you and your family and friends to make memorable moments and step outside of the hectic pace of life. The atmosphere is in a word real. The only improvement that could be made would be larger parking spaces that accommodate standard vehicles We've had a lot of damage done to our car from improper parking by our neighbors . Fantastic place to live for the newly marriedsubmitted by Haley A. - Sep 05, 2016 |Recommended: YesIt is wonderful living. The key-less entry is great, we barely ever hear our neighbors at all, the air conditioning is nice, the layout of the apartment is nice, and is reasonably priced. Free internet with google fiber as well. The only thing you pay is the electricity. Our only struggles with this apartment is the limited and small parking spaces there is tons underground as well, but I didn't like it , and then the laundry machines always seem to be full. Those aren't huge concerns, though. Fantastic place to live, very cozy, no real complaints, happy to live here. Helpful, great maintenance, good neighbors environmentsubmitted by Matthew B. - Apr 05, 2016 |Recommended: YesCambridge Court is very good quality living for the price that you pay. We feel very comfortable here. The maintenance staff is punctual and the office does all they can for the residents. Great first apartment submitted by Jessica S. - Feb 05, 2016 |Recommended: YesJust got married, moved in to Cambridge Court Apartments, and we love it Best deal we could find in Happy Valley. Reserved underground parking, gym, laundry room, garden spaces. Staff is awesome, very helpful -- maintenance responds quickly to any issues. Great for newly weds, with wonderful maintenancesubmitted by Benjamin B. - Jan 02, 2016 |Recommended: YesThis apartment complex is a very nice place to live, and I would highly recommend it to anyone. The only complaint I have is the small parking spaces. there is always available space, but some spaces are really hard to get into bc they are so small.